In hilly Boeotia, specifically the village of Skourta, is the Convent of the Holy Ascension of the Lord. 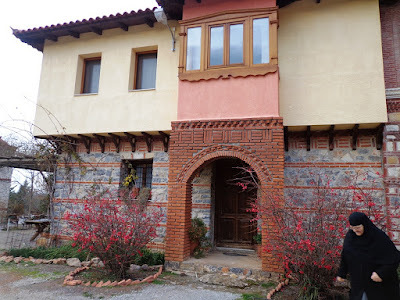 It is a relatively new Monastery, under the spiritual guidance of Elder Polykarpos. 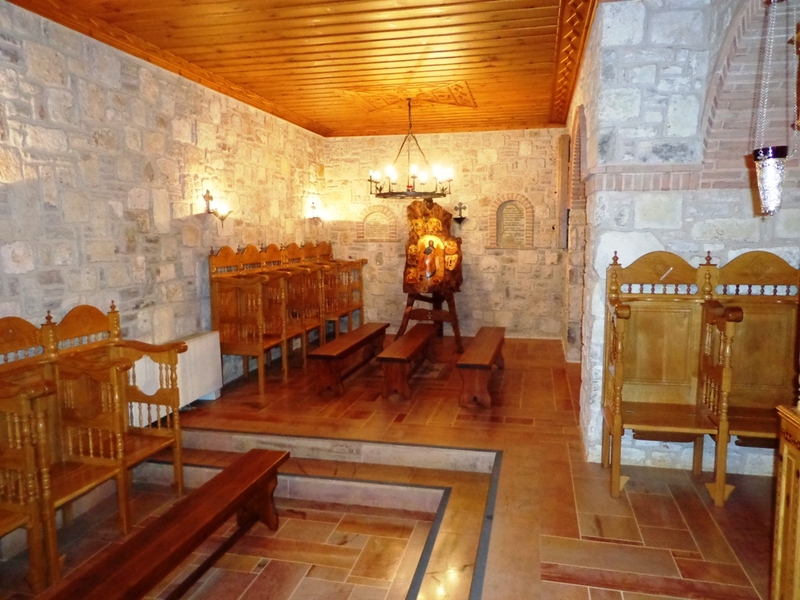 The Monastery was slowly and steadily built, and it is a living ecclesiastical artwork revealing the passion and love of its founders. It is truly a gem of Orthodoxy and of the monastic community. Among the important treasures of the Monastery, besides relics of Saint John the Russian and Saint David of Evia, is the miraculous icon of Saint Anna, which is located in the Church or Catacomb of Saint John the Forerunner, beneath the Church of the Ascension. 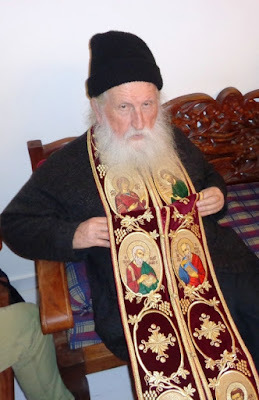 As befits a miraculous icon, its history is wondrous. 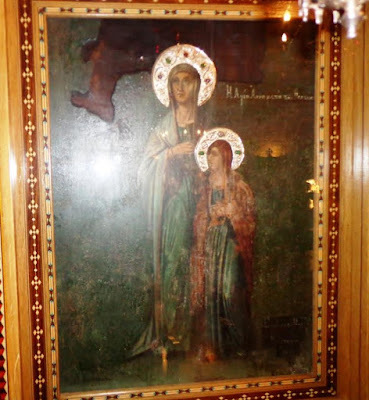 In 1881 a resident of Krini (Cesme) in Asia Minor asked Saint Anna, the mother of the Theotokos, to grant her a child, and in return she would dedicate an icon to her grace. Indeed, it was not long before the woman bore a child through the intervention of Saint Anna, so this faithful servant of God sought for an iconographer in Kydonia (Ayvalik) to paint the image of the Saint, which he did. This icon was monumental for the vitality of the Saint's face, and unique in that it depicted her with the Theotokos at the age of twelve. It is rare to see an image of the Theotokos at such an age. 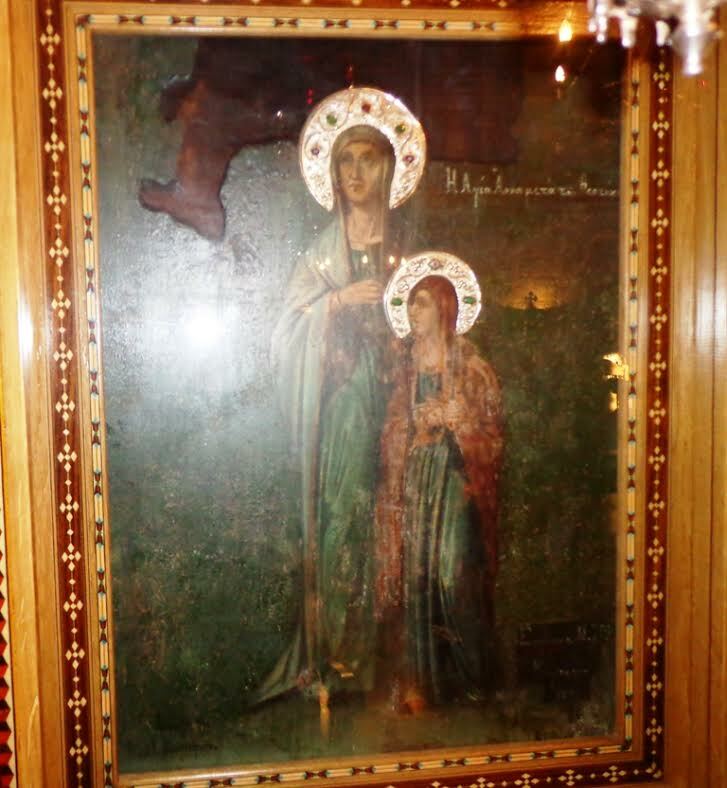 The faithful woman took this icon and gave it as an offering to the Church of Saint Photini in Smyrna, and almost immediately the miracles began. Saint Chrysostomos, who was the Metropolitan of Smyrna at the time, would himself send couples there who were unable to conceive children, in order to pray before this icon, and after forty prescribed days of fasting, the Saint would wondrously grant the couple a child. This literally took place thousands of times. In 1922 the Asia Minor Catastrophe came. The brutalities and atrocities of the Turks in Smyrna did not stop with lootings, rapes and murders. They even invaded churches to steal what was valuable, and destroyed the rest. 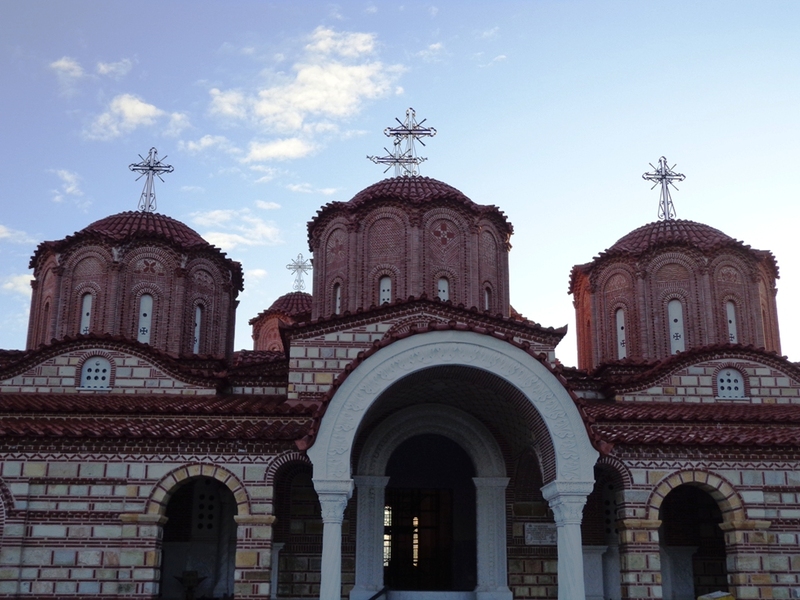 The Church of Saint Photini was not spared from having its icons destroyed and the building set on fire. At that moment there passed through the area Jasmine Kolar, who because she was being escorted by staff of the British embassy could cross the area with relative safety. She had gone to get her cousin who worked in the British embassy. As she walked by she came across the unholy and repugnant spectacle of the icons of the church being put to the flames. Without much thought she called for a Turkish boy named Ali who was accompanying her, and giving him what money she had she told him to go to the armed Turkish men and bribe them so she could gather all the icons that had yet to be thrown to the flames, for she said: "God will burn us if we observe our heritage being burned." Ali managed to bribe the Turks and grabbed the first icon and brought it to Jasmine. Jasmine was filled with emotion when she saw that the icon that was saved was that of Saint Anna, which was the very icon her mother dedicated to the church forty years prior as an offering for the gift of her firstborn child! This fact is literally miraculous! From that moment the icon was kept as a family treasure all her life, and miracles were done for those who called upon Saint Anna with faith. As the years passed the family heirloom came into the hands of the descendants of Jasmine, specifically the Maistraki family. 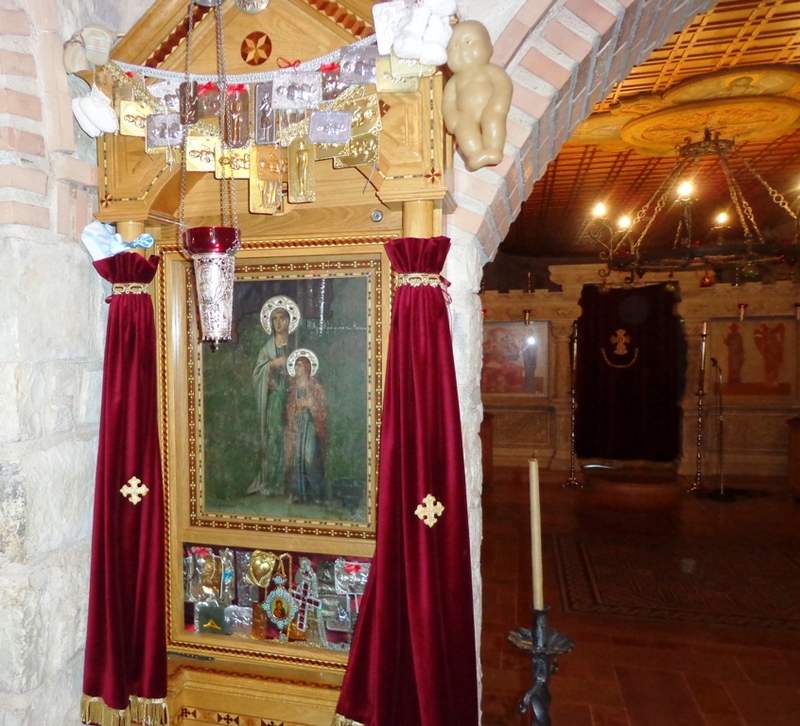 The Maistraki family decided to donate the icon to the Monastery of the Ascension in Boeotia, in order for it to be a source of blessing to as many people as possible. Since then thousands have given birth to children through the prayers of Saint Anna. There is an abundance of evidence that childless couples, many with serious problems, after a vow to the Saint were able to bear children.